Guess what I found out yesterday? It’s National Pancake Day (at Ihop, at least). Since going out to restaurants with a preschooler and a baby is more than a little difficult, I decided to make some pancakes at home in honor of Pancake Day. Now if you are a calorie watcher like me, you might be tempted to ignore the little suggestion at the very end of the recipe. The one that mentions butter (salted, please) and syrup. But don’t. 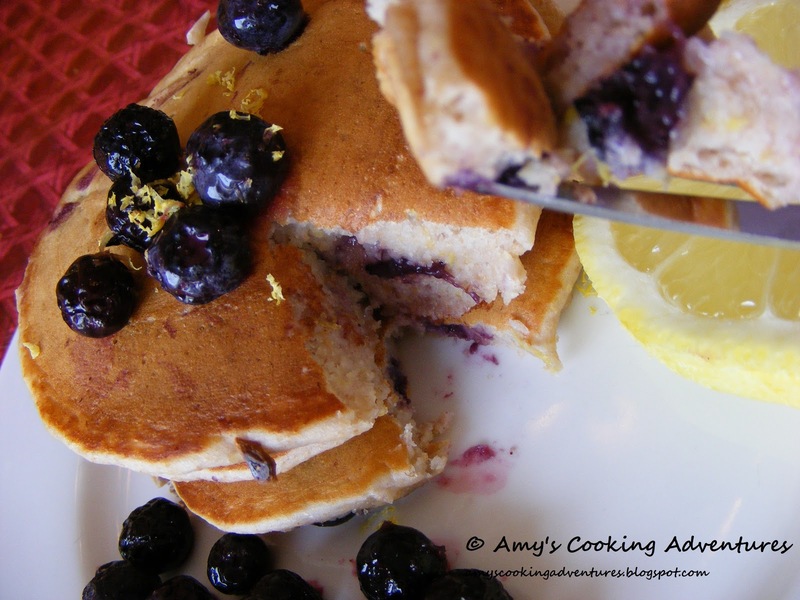 Trust me, the saltiness of the butter and the sweetness of the syrup make the lemon and blueberry flavors pop and there is an explosion of flavor in your mouth that just doesn’t happen without the butter and the syrup. Plus, you put fruit and flax and Greek yogurt in your pancakes, I think you deserve a little splurge! In a medium sized bowl, whisk together lemon zest, lemon juice, milk, yogurt, eggs, and honey. Stir in blueberries. In a separate, large bowl, whisk together flours, flax seed, baking powder, and salt. Pour the liquid ingredients over they dry ingredients and stir until combined. If the batter is too thick, add additional milk, 2 tbsp at a time. Scoop pancakes onto a skillet using a ¼ cup measuring cup. Cook over medium-high heat 2-3 minutes or until golden brown. Flip and cook an additional 2-3 minutes until browned and cooked through. 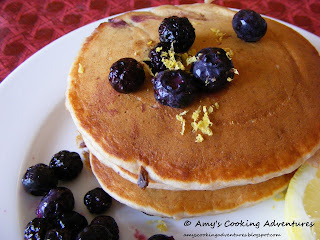 Serve with butter, a drizzle of maple syrup and a few extra blueberries.